NetPhone combines business VoIP with Hosted PBX functionality programmed into an IP phone. It is perfectly suited for businesses looking for an out-of-the-box solution to their office telephone needs. And you do not require a telephone line to make it operate. Only plug the NetPhone into a suitable broadband service and you are up and running. It's as straightforward as that. 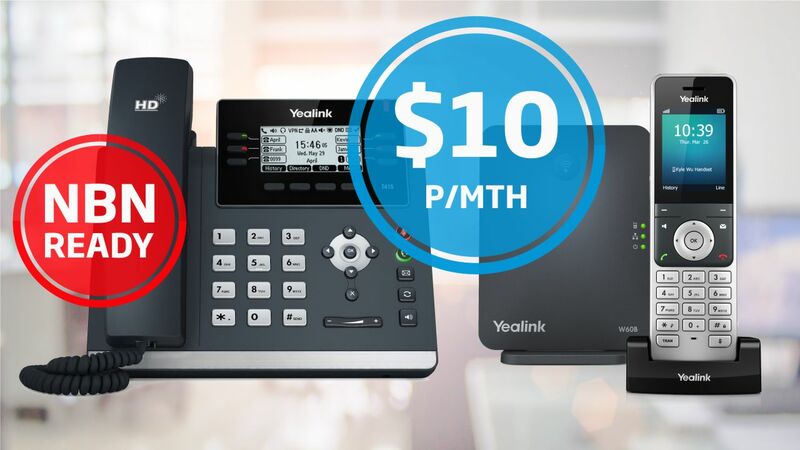 Choice of 2 plans at $11 per month including the IP phone delivered to your address (AUS only). Optional 1300 or 1800 number at unbeatable rates. Includes P&H to an Australian address. All timed calls are billed per Second. The NetPhone comes complete with a multi-channel SIP trunk and enterprise grade hosted PBX functions, both delivering the ultimate in business IP telephony. Mobility Feature - make both your desk and mobile phone ring at the same time. Multi-Party Conferencing - multi-way audio conferencing for easy conference calls. Voice 2 Email - your voicemail messages emailed directly to you. Business Intro Message - promote your brand by playing an intro message at the start of every call. Auto Attendant (IVR) - set up an IVR to route calls to specific answering points. On-Hold Music/Pre-Recorded Message - automatic on-hold music or set-up your own on-hold messages. Call Park - place a call while putting another one on hold. Call Transfer - easily transfer calls to other destinations. Call Queuing - enable multiple inbound calls to be placed on hold and go into a queue. Do Not Disturb - divert calls to another answering point at a touch of button. Auto Divert - set automatic call diversion based on time of day and date. Hunt Groups - pre-select the IP phones to ring upon an incoming call. Simultaneous Ring - make all phones ring upon an incoming call. Sequential Ring - pre-select the order of IP phones that ring upon an incoming call. Any Extension Pick Up - allow incoming calls to be answered from any extension. Free Inter-Account Calls - calls are free between extensions regardless of their location. Remote Office - display only one main number when calling out from any extension. The NetPhone is much more than just a business phone. It combines the latest in IP telephony with a feature rich IP phone, that both deliver a complete communication system for all types of business requirements. NetPhone combines hosted PBX functionality with business grade VoIP. The VoIP service is delivered via an enterprise grade multi-channel SIP trunk, letting you make and receive several calls at the same time. Ideal for phone conferencing and taking advantage of the IP phone's built in multi-party audio conferencing feature. Being a fully featured hosted PBX system, the phone comes with a complete set of PBX functions, and you can add as many extensions as required. Calls are free between same-account extensions, no matter where they're located. Ideal for multi-site businesses, remote offices and executives that travel overseas. Our timed calls are charged on a per second basis and that means you only pay for what you use. There is no flag fall or calls charged in blocks of 30 seconds. The plans also come with cheap calls to make sure your business keeps the telco costs down. The set up fee includes supply and delivery of the IP phone. And its yours to keep. There are no expensive handset rental payments and the plan has a month to month term. And that means complete flexibility for your business and no lock-in contracts. The NetPhone is completely portable and will work the same way as long as it's connected to an adequate broadband service. It's provisioned online and you can make immediate changes to the setup configurations. NetPhones are totally portable and come with flexibility unmatched by traditional phone services. They come with total PBX functionality and a plethora of call handling and call management functions. And that makes them a perfect office phone solution for a number of business requirements. The ideal home office telephone with no need to waste money on a fixed phone line, just utilise your existing broadband service. And it has functions and features that mobile phones can not match. A very cost effective means of delivering a fully functional PBX system into any small business operation. Offering a high degree of flexibility and ready to be scaled to suit your business needs. Whether its a temporary site or a permanent satellite office, a NetPhone is one of the best solutions to deliver office telephone facilities without needing to install phone lines or a PBX system. Being completely portable, simply unplug the IP phone and relocate anytime. A direct replacement for the traditional telephone, it’s configured with a SIP Trunk that allows it to make and receive phone calls. SIP Trunks are business VoIP lines that replace traditional telephone lines. They enable the IP phone to be plugged into a broadband service and operate just like an ordinary telephone. They come with a telephone number and basic call operation features. For further details please download the Critical Information Summary or contact our Customer Care Team on 1300 000 300.